The SMARTEMP Drum Displacement Diffuser, type DDF-FD, produces a low velocity radial airflow pattern from a perforated cylindrical discharge face made of powder coated galvanised steel. 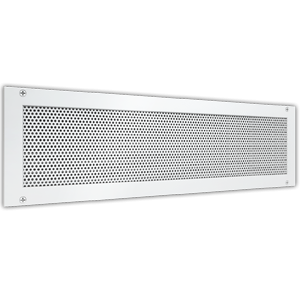 Air oozes out of the perforated face with minimal mixing, to produce a low velocity, low level lake of high quality supply air that floods the floor with displacement airflow. A low level occupancy microclimate of enhanced indoor air quality is created, in which convective currents from heat sources in the occupancy zone, such as occupants, equipment and lights rise upwards, drawing in high quality replenishment air from the occupancy microclimate, to envelope the heat sources in cooler, high quality air. Heat and contaminants stratify at a high level in concentrated form, where they are removed from the space . Due to stratification of heat, relatively large supply-to-return temperature differentials are achievable – dependent on ceiling height – despite the relatively high supply air temperature (typically 20° C), thereby minimising fan energy. Energy savings also accrue from the extended free cooling range typically achieved by the elevated supply air temperature, as well as from the potential to reduce outdoor airflow rates due to the enhanced indoor air quality resulting from the improved ventilation effectiveness of the low level displacement supply. Thermal displacement room airflow, with low turbulent airflow supply into the occupancy microclimate. Heat and contaminants rise to a high layer of stratification by natural convection. Enhanced levels of indoor air quality are attained in the breathing zone. Protruding from the floor, typically at least 1 m from seated occupants. Horizontal throw dependent upon VAV airflow rate. 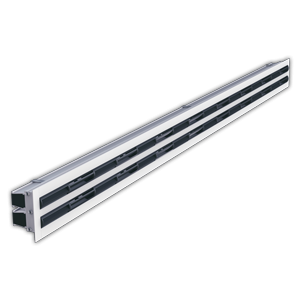 Air is discharged substantially horizontally from the perforated diffuser face. The diffuser face is cylindrical. 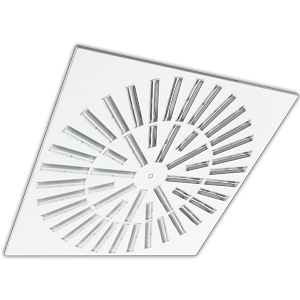 The diffuser face is made of perforated sheet metal. 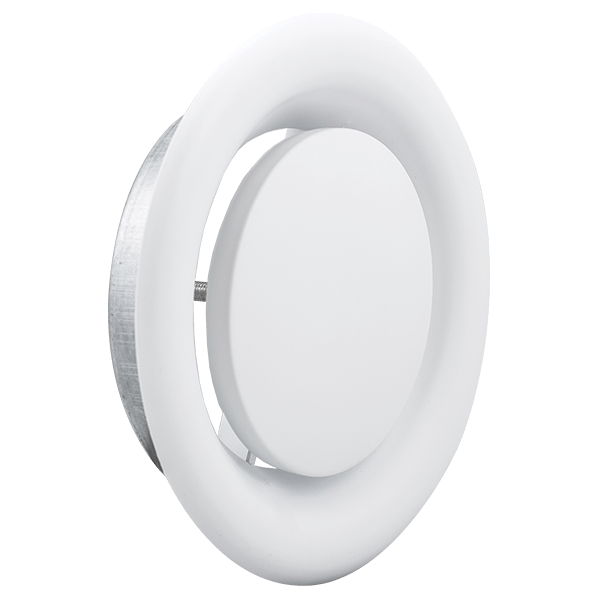 The SMARTEMP Drum Displacement Diffuser, type DDF-FD, discharges low velocity supply air with fixed horizontal discharge direction in a radial pattern for displacement airflow supply in commercial spaces. 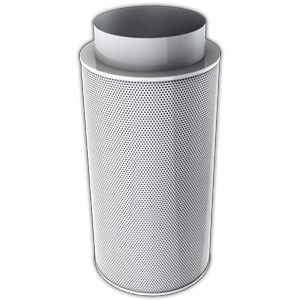 Air supply across inner and outer perforated cylinders provides uniform, low turbulence discharge across the entire perforated drum-shaped face. High quality air oozes from the diffuser with minimal mixing, spreading radially to flood the floor with a lake of displacement airflow. A low level occupancy microclimate of enhanced indoor air quality is created in which convective currents from heat sources such as occupants, equipment and lights rise upwards, drawing in high quality replenishment air from the occupancy microclimate and enveloping heat sources in cooler, high quality air. Heat and contaminants stratify at a high level in concentrated form, where they are removed from the space. Due to stratification of heat, relatively large supply-to-return temperature differentials are achievable – dependent on ceiling height – despite the relatively high supply air temperature (typically 20°C), thereby minimising fan energy. Energy savings also accrue from the extended free cooling range typically achieved by the elevated supply air temperature, as well as from the potential to reduce outdoor airflow rates due to the enhanced indoor air quality resulting from the improved ventilation effectiveness of the low level displacement supply.